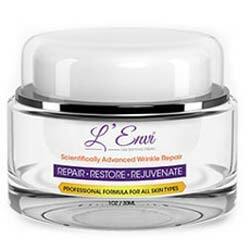 L'Envi Anti Aging Moisturizer Review: Is it Really Good Enough? L’Envi Anti Aging Moisturizer Review: Is it Really Good Enough? L’Envi Anti Aging Moisturizer is an anti-aging treatment which promises to restore healthy appearance to your skin through a range of methods. While these methods aren’t discussed in great detail, the makers do compare it to the “beauty secrets of Hollywood,” in other words, how many celebrities appear more healthful than you might expect from their age. It is available from a major online retailer for $24 per one-ounce jar. Apply a pea or dime-sized amount to the face and neck twice per day. Smooth in and allow to absorb fully before you apply makeup. You can also use it more often if you want. Reasonably priced, especially compared to many other products. Easy to use; just wash and rub it in to absorb into your skin. Lots of customer feedback is available, indicating both some positive attitudes and that the product’s been in use for a while. Available in many retail outlets, so you can shop around for the best bargain. We don’t have specific information about the ingredients in this formula. There is no clinical research (at least, none that gets shown to prospective customers) to back up the claims of this product being effective. L’Envi Anti Aging Moisturizer is a reasonably priced anti-aging product and doesn’t present itself as a single sure-shot solution to every problem with negative skin appearance or a replacement for dermatological treatment. Unfortunately, it lacks real clinical evidence – or indeed, much information – to support its choice of ingredients, making it hard for us to give it our full confidence. There is a wide range of beauty care and anti-aging treatment products in the modern marketplace, and the more expensive products aren’t necessarily any better than more reasonably priced options. Shop around and pick out what you feel you can trust.